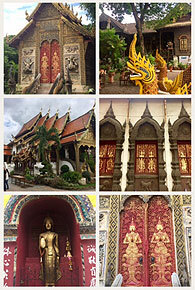 Chiang Mai is a city of temples. Here's two we particularly enjoyed. The first is small, very spiritual, a working temple, a popular place of worship for the local community on the east side of the Ping River. It houses a beautiful old Royal residence and and can be easily viewed and enjoyed if time is a factor. For a more leisurely visit I found the Royally endorsed Wat Phra Singh, built in 1345 (672 years old!) fascinating and rich in history. The painted wall murals are particularly unique. Wat Phra Singh is a must see. If you see one temple in Chiang Mai this should be the one. It's main sala is exquisite. We visited for approximately half an hour it's a small compound and easy to navigate. In the heart of the temple grounds there is an impressive pagoda - the Ket Kaew Chura Manee pagoda. 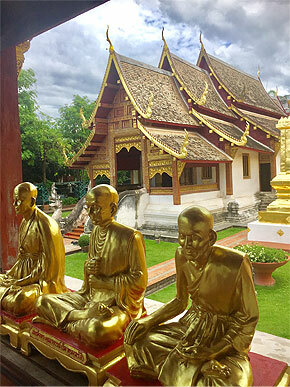 The temple has gone through some name changes and shows the unique and diverse cultures that go into making Chiang Mai such a special and warm place to live or visit. It is truly Lanna yet has buildings that are of Chinese design and influence, some buildings are european influenced with Thai features. See how the blend and mix has made this place a special place to visit. Located along the Ping River, the temple grounds also houses a museum. The museum building was once a monk’s residence – Phra Khru Chaisiwimon who lived 1886 – 1957. The museum was established to house various items donated by the local community. Many of them everyday objects including TV's; typewriters, antiques and old photos which tell the story Chiang Mai city. The temple is located at 96, Ban Wat Ket, Charoen Rat Road, Amphoe Mueang, Chiang Mai. Wat Ket Karam is also know as Wat Gate. Open daily from 8.30 am to 5.00 pm. Wat Phra Singh or full name Wat Phra Singh Worawihan is a stunning and important temple complex. King Ananda Mahidol (Rama VIII), the older brother of the late King Bhumiphol Adulyadej (Rama IX), bestowed on it the status of Royal temple of the first grade in 1935. Wat Phra Singh is located inside the old city wall, at the western end of Ratchadamnoen Road, the temple’s signature Lanna-style roofs and glittering architecture invite visitors. It is truly one of the highlights of Chiang Mai. Immensely spiritual, the complex is not only pleasing to the eye, but a popular place of worship. We visited in bright sunshine and the temple truly glitters. It's a golden place with cool garden walkways, lined with trees for shade. The happy sound of children playing, permeates the complex from the nearby school. A temple and chedi was first built by King Pha Yu in 1345 to house the bones of his father King Kam Fu. The original name of the temple was Wat Li Chiang Phra but this was changed to Wat Phra Singh when the Phra Sihing Buddha image was first housed here in 1367 and the temple complex received its present name. Worshippers pay their respects to the Phra Singh Buddha image. The Buddha image is now housed in the main building (Viharn Lai Kham - literally gold pattern hall) along with the temple's famous murals. The original viharn was built towards the end of the 14th century and replaced by the current building in 1925. Another highly revered Buddha image - Phra Chao Thong Tip is also housed nearby. This gold and copper image of a seated Buddha was cast in 1477. Renovations were carried out in the 1920’s when monk Khru Ba Srivichai supervised the construction of the present main viharn and rebuilt the chedi. The ubosot and scripture library were also renovated in 1929. The small scripture repository is the finest of its type in the north. The oldest structure of the wat is the main chedi (1345). The chedi is circular in shape with a square base. Each of the sides of the chedi is decorated with elephant figures emerging from the chedi. Since its construction in the 14th century it has been enlarged considerably. On the inner walls of the Viharn Lai Kham are the murals originally commissioned by Chao (King)Thammalangka of Chiang Mai (1813). These are famous for their period style and the detail depicting northern Thai scenes and the ways of the Burmese Court. The murals show two fables. Prince Sang Thong of the Golden Conch painted on the north wall and the Heavenly Phoenix on the southern wall of the hall. Recent restoration has removed the earlier restoration of the 1920’s to show clearly the original style of the work. The temple complex is open daily from 6.00 am until 5.00 pm.